Twinshield is a combination gasket, consisting of a knitted wire mesh bonded to a non conductive elastomer strip. 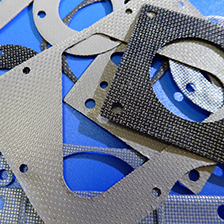 The product is available in a variety of permutations of mesh and elastomer, to combine excellent EMI performance, with a dust, environmental, or pressure sealing capability. Monel, TCS, aluminium and stainless steel wire types are all available, either with or without an elastomer core. 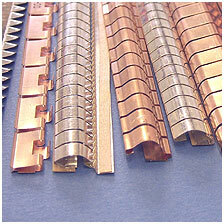 When selecting wire type, it is important to consider optimum shielding performance versus galvanic compatibility. 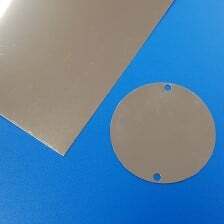 Either solid mesh or elastomer cored mesh can be used to configure in EMI performance, a second mesh gasket can be bonded to the other edge of the rubber strip. EPDM, neoprene (or a blend of both) and silicone rubber may be used in sponge or solid form, for the non conductive carrier strip. A pressure sensitive self adhesive backing can be applied for ease of application. Twinshield is available in continuous lengths of up to 10 meters or cut to size. 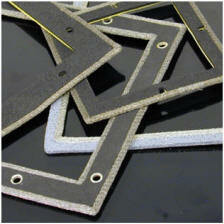 The alternative is for us to supply you with custom made ‘picture frame’ gaskets, in accordance with your drawing. Mechanical compression stops can be incorporated into the design of the gasket, thereby limiting the risk of causing compression set, or damage to the seal. Compression stops are available in two forms, as an aluminium collar which is bonded into the fixing hole, or as a small metal disc which is normally fitted either side of the fixing holes. In both cases the ‘stops’ are designed to allow a predetermined level of compressive force to be applied to the gasket. Moulded Twinshield is a variation on the conventional product design in as much as the knitted wire element, rather than being bonded to the rubber, is moulded into a solid silicone elastomer. The product is normally supplied as an ‘0’ ring for fitting into a channel, where it can provide full environmental protection, so long as the fastener arrangement is designed adequately. A table of standard part numbers is shown on page 30, however if the size that interests you is not shown, please contact us to discuss your requirement. 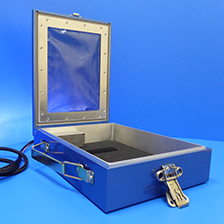 Twinshield can be configured using a multitude of different profiles and sizes. Monel DIN 17743 or B53075 NA13, alloy 400L. Wire diameter 0.11mm.